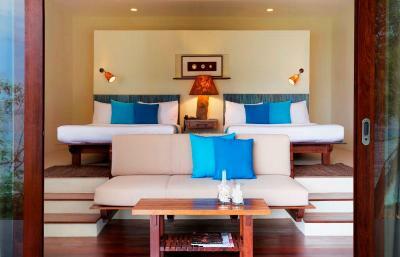 Lock in a great price for Sumilon Bluewater Island Resort – rated 8.7 by recent guests! The beautiful corals in the sanctuary. Great for snorkeling. Beautiful sandbar. Property was gorgeous! Location is amazing. Very relaxing. 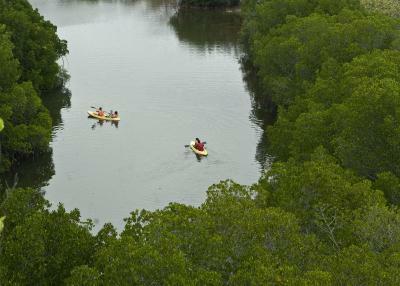 There are activities (such as snorkel, paddle boats, trekking, beach, pools) throughout the property. Staff and food was great as well. The resort had enough activities to keep the kids entertained. The restaurant had great view of the water. This resort was incredible. Beautiful views, rooms, facilities and service. A lovely spot for a romantic get away. Need to provide extra toilet papers, don’t provided one roll at a time. Room Too expensive, reservation through booking.com not impressive, very unhappy with booking.com. Booking.com room and price accommodation didn’t meet my expectations, very unhappy. I will not booked through booking.com again!!!! 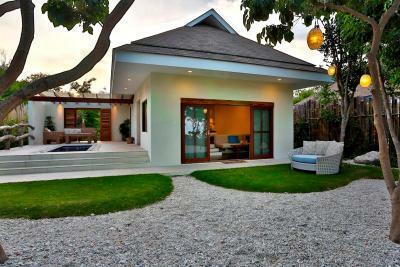 I love the private villas! They are secluded! Love the infinity pool too! The location is amazing and the Sumilon Island is just like the pictures. 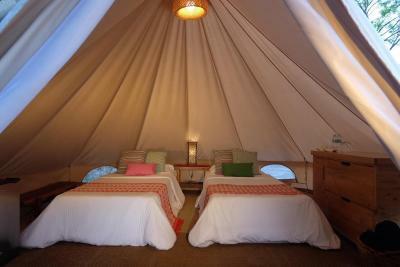 The glamping tent was just in front of the beach. Breakfast was really good. 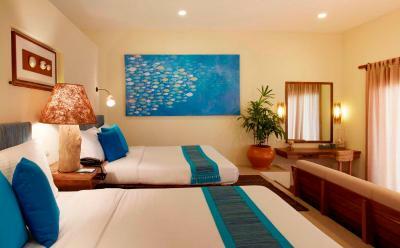 Our spacious room with the sea view( premier deluxe room no. 18). The abundant breakfast and dinner buffet. The great snorkeling around the sandbar. They are baby reef sharks during high tide just in front of the resort sometimes like 20 of them. 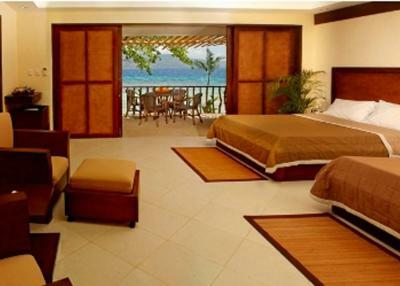 Sumilon Bluewater Island Resort This rating is a reflection of how the property compares to the industry standard when it comes to price, facilities and services available. It's based on a self-evaluation by the property. Use this rating to help choose your stay! The only resort on the island, 24-hectare Sumilon Bluewater offers 4-star accommodations with direct access to coral reef beaches. 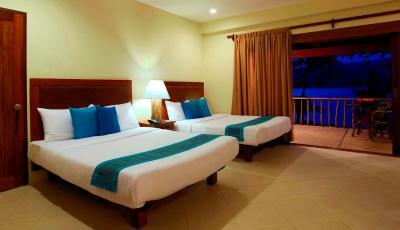 It features free WiFi in public areas and an outdoor pool. 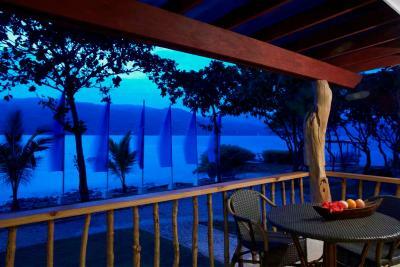 Spacious cottages at Bluewater Island Resort Sumilon feature a private veranda with lounge chairs. They are air conditioned and have a TV, work desk and safe. 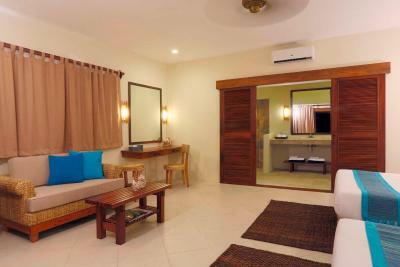 Hot/cold shower is available in the private bathroom. 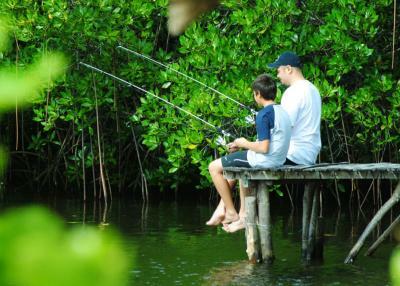 Guests can enjoy massages or activities such as fishing, snorkeling and diving. Gifts can be bought at the resort’s souvenir shop. 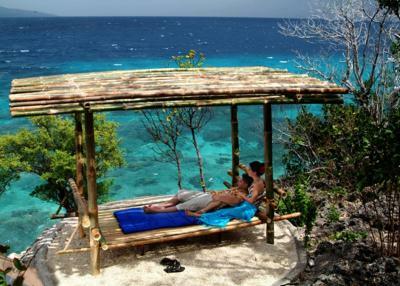 Sumilon Bluewater can also arrange cave tours and excursions. Free private parking is available. Light refreshments, local and international dishes are served at the resort’s restaurant. 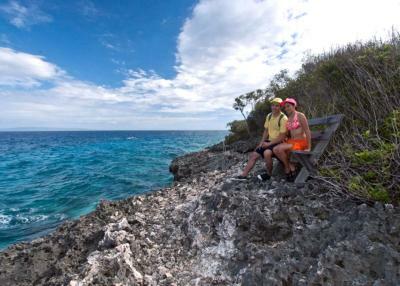 Sumilon Bluewater Island Resort is a 3 to 4 hour ride from Cebu City. 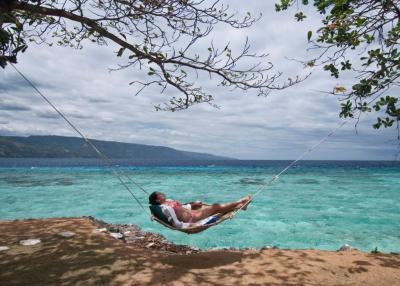 It provides free scheduled 2-way transfers between Oslob and Sumilon Island. 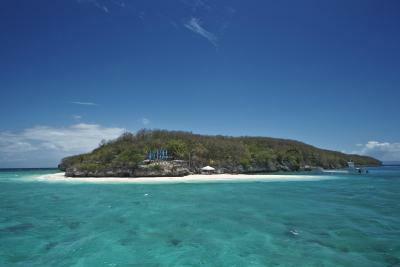 This property also has one of the top-rated locations in Sumilon Island! Guests are happier about it compared to other properties in the area. 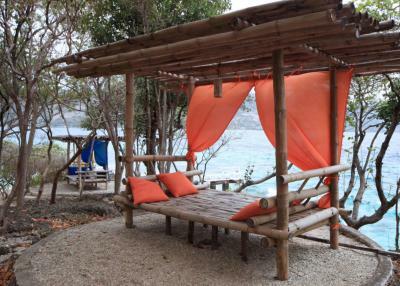 This property is also rated for the best value in Sumilon Island! Guests are getting more for their money when compared to other properties in this city. 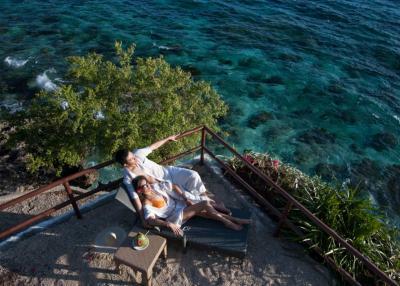 When would you like to stay at Sumilon Bluewater Island Resort? 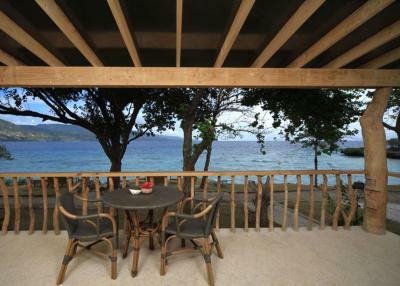 Duplex cottages feature a private veranda with views of the sea. 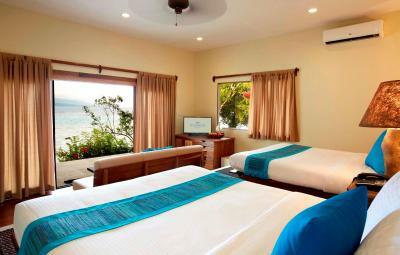 Fitted with a balcony and large beds, this room features air conditioning, a mini-bar and facilities such as a flat-screen TV with a DVD player. Includes a living area. 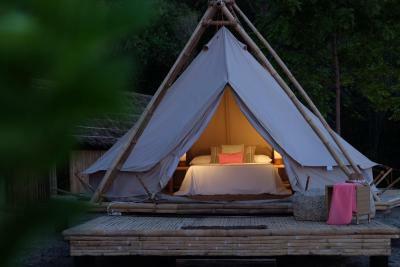 A great alternative to traditional camping, Glamorous Camping (Glamping) offers pre-pitched tents under the stars, equipped with electricity. 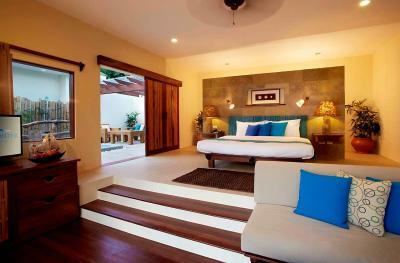 Featuring lagoon and ocean views, this one-bedroom villa comes with a veranda and private plunge pool. 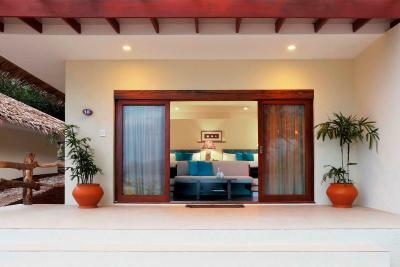 Featuring lagoon and ocean views, this spacious two-bedroom villa comes with a veranda and private plunge pool. 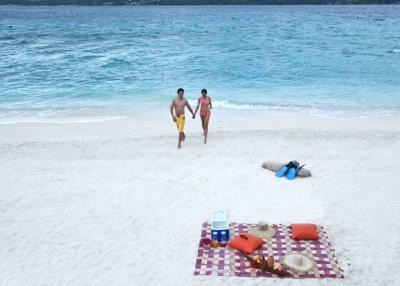 House Rules Sumilon Bluewater Island Resort takes special requests – add in the next step! Sumilon Bluewater Island Resort accepts these cards and reserves the right to temporarily hold an amount prior to arrival. Children aged 4 years old and below are entitled to free half board meals and children aged 5 to 11 years old will be charged 50% of the adult price for breakfast and dinner. The bed is really small. I'm only 167cm and my feet we're almost outside the bed. For two people is really unconfortable. For the price we have payed we we're expecting at least a confy bead. I recommend a dress code during dinner! I mean it is a 5 star resort ;) I think a decent outfit would be appropriate. In the morning there are a lot of tourists on the sandbar, but there is enough space for everyone. Wonderful room with glass doors into a double family cottage with two queen bed, a sofa, a very big bathroom with two sinks, a rocking chair on the patio and a hammock between two trees in front of the room door. I reserved a wonderful private romantic dinner on the sandbar and all was perfectly provided, with a great effect on my wife. Very luxurious and exclusive. We also asked to the resort to organize the whale shark swimming : all perfect! Wonderful experience!!! Some spots were not the greatest for wifi. They also don't have enough boats schedule throughout the day so if you end up not being able to make their boats, you need to pay a hefty amount to get to the island. Also, they quoted me differently for extra pax as soon as we got on the island. LOVED their breakfast and dinner buffets. They were really, really good. The rooms were absolutely beautiful and right in front of the water where sometimes you can see baby sharks swimming around. Sumilon is such a beautiful island. 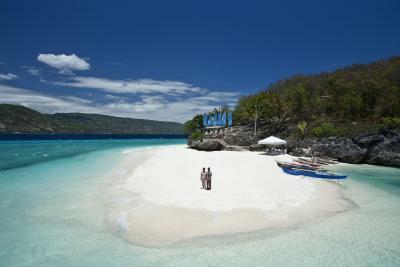 We were very unsatisfied with our 2 night stay in Sumilon Island. I would noone advise to go there! - poor service - massively overpriced (unfortunately everything: rooms, drinks, tours etc) - bad food (breakfast always the same and dinner buffet not tasty (exception salad) - complete resort looks like it 20 years old and nothing was renewed - no lovely details on the island (no nice lights or lounge furniture) - day tourist (there are so many people especially on weekend coming to the island and being in the same areas like the resort guests. - ridiculous high costs for transport back to cebu (we did it with an own driver for half of the price!) This ist my first negative review on booking but this resort was really wasting money. My wife was so unhappy (it was our love anniversary). I cannot understand how this resort can host guest. I would never ever go again. The WC in the bathroom wasnt working and they didnt change my room. I asked for a massage but therapist when came in my room didnt want to make me the massage because I had a glass of wine in my room.